BREA, Calif. – (April 2014) – When you think of Fall, what images come to mind? Gelish Soak-Off Gel Polish sees the brilliant colors of nature: changing leaves, crisp red apples, warm mulled cider and colorful sunsets. Just in time to see the seasons change, Gelish offers Get Color-Fall Fall 2014 Color Collection, a warm autumnal palette to get you excited for all that Fall has to offer. If it’s time for an autumn escape, take a page from Gelish’s color almanac and get polished with a new collection of colors. The Get Color-Fall Collection will be on-shelf August 2014 and will be available as a 6 piece display, 12 piece display and as open stock. 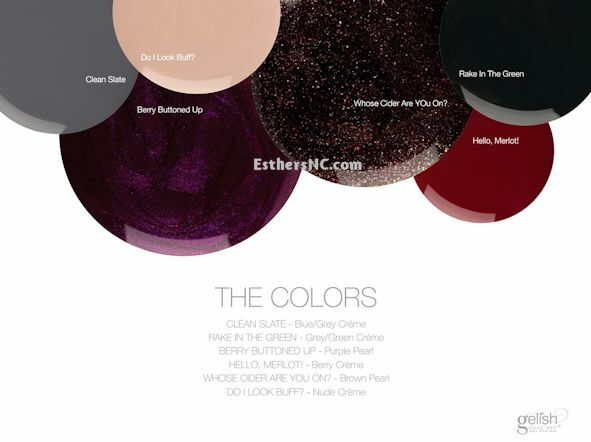 Gelish Fall 2014 will be available at Esther’s Nail Center, your online source for at-home gel nail supplies.